LAS VEGAS, NV - SHE Outdoor Apparel was at SHOT Show 2010 with a myriad of products, including a few that are new for 2010. We spoke with Alyssa Klinkenberg, Technical Design Manager, about what SHE has to offer in 2010 for women who love the outdoors. Alyssa next showed me the popular SHE's Core 4 (C4) system that includes jacket, pants, vest, gloves, and beanies, but we just looked at the jacket and pants. 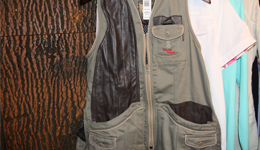 The C4 system is waterproof, wind resistant, has arm vents in the jacket, and includes a unique bib system for women with a patent pending zipper that goes around the inside of the vest and connects to the pants, creating a convenient, warm bib system for women. If you aren't wearing the vest and just have the jacket and won't need the zipper, Alyssa showed me how you can just snap all of the snaps on the pants and it creates a belt holder. All of the pieces are body-mapped with Arctic Shield, and SHE placed the Arctic Shield in places where you lose the most heat - across the chest, across the thighs - because if it were in every pant, you would overheat. Also, all of the pieces have Thinsulate insulation for more cold weather protection, and the zippers are all waterproof. Another really great feature is the pants have a built-in adjustable cinch feature, helping you keep the fabric snug around the boots. 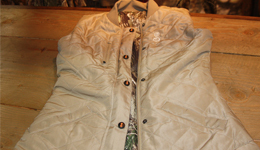 Overall, I was very impressed with the entire line of SHE Outdoor Apparel, designed for hunting, shooting, safari, adventure, accessories, and also includes lifestyle apparel such as tees, jackets, and hoodies. 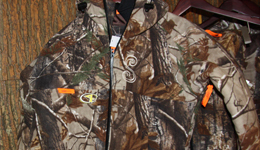 For more information on the entire line of SHE Outdoor Apparel, visit their website.